FORT BRAGG, N.C. - After three deployments to Iraq and three to Afghanistan, Staff Sgt. Dennis Swols is agitated, prone to bouts of anger and unable to really talk about his time on the battlefield. "I have a hard time talking to people about my deployments and everything," says Swols, who is with the 82nd Airborne's 4th Brigade Combat Team. After taking part in the invasion of Afghanistan in 2001 and the march into Baghdad in 2003, he's been diagnosed with post-traumatic stress. "But having her here, I just pet Lexy. Or I'm just sitting here and we won't talk about deployments, we'll just (talk) about the dog. ... My day is better every time I come in." Lexy's move into therapy was unexpected. Rumayor decided to put her new puppy through the training when she realized Lexy was less of a guard dog and more of a calm cuddler. So, Lexy went through about 2 1/2 years of training before she was able to pin on her rank — she's a lieutenant colonel — and become certified as Fort Bragg's only therapy dog. "It's hard for me to come to these appointments. I can't really sit in the waiting room," said Woodruff, who suffers from obsessive-compulsive disorder. "I don't look forward to this whole process of being here. ... The whole process of being here is something that's agitative to my diagnosis." But on a sunny Wednesday morning, the Alabama native is sitting in Rumayer's office. "This is the only one I look forward to going to because of Lexy. I love dogs." "Stigma is one of the huge things the military is trying super hard to overcome — behavioural health stigma being the biggest one, I think. And Lexy is probably the biggest asset I have in overcoming that stigma," Rumayor said. "There's nothing better than coming to an appointment where you get to have a warm fuzzy thing that you get to pet all the time. People don't want to come in the door. When they see her coming in, it makes them want to come in the door." Navy Capt. Robert Koffman, the senior consultant for behavioural health at the National Intrepid Center of Excellence in Bethesda, has a therapy dog of his own, named Ron. And he's seen the broad impact the dogs can have. Ron, a 3-year-old golden retriever/labrador mix, holds the rank of a one-star general and his designated military occupation is a "psych tech." He's even trained to bring tissues to distressed patients and put his head on a person's lap if he or she is stressed. "It's tough for anybody to go to their mental health provider," said St. Laurent, who also runs the Therapeutic Service Dog Training Program. 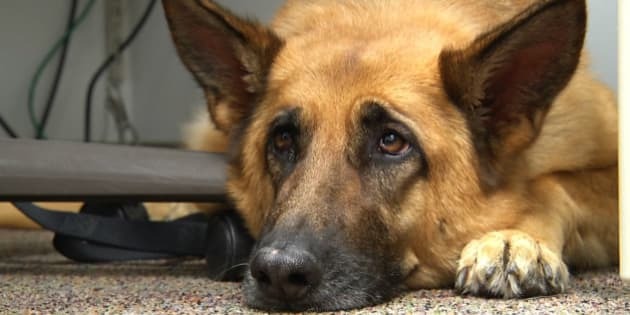 "But they need to see mental health providers and if you're introduced to the mental health community by a fluffy, loving canine, you'd be more inclined to come to the clinic and pet the dog. And one thing leads to another, and you're in the clinic."